The W3 is noticeably slimmer than the previous W1, making it far more pocket-friendly, although it is still on the large side for a compact camera. The lens cover alone, which slides down to reveal the dual lenses and flash, adds significant bulk; the camera would perhaps be better served with individual thin lens covers. It is also fairly heavy at 230g, despite again being lighter than the previous model. On the rear of the camera, however, the space has been well used, with most of it filled by the gigantic LCD screen. The mode dial and D-pad controls to its right are very usable and allow easy control of the camera. 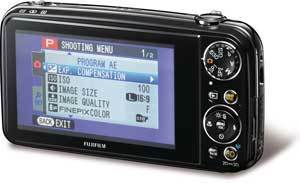 The menu system is much in keeping with that of other Fujifilm compacts – much more so than the W1 – making it easier to navigate. One slight annoyance with the W3 is, that, because of the second lens, many users will need to adjust the regular grip they would take with a compact in order to keep fingers clear of the lenses. This is perhaps unavoidable but it can result in some stray digits in shot before you get used to it.